Protection comes in many differing forms; Threat Identification and Education, Tactics, Techniques and Procedures (TTP’s), resilient waveforms, signal cancellation, carrier identification, and the ability to geolocate and identify adversaries. IGC’s Protected Communications Team is investigating all these types of protection, so as to provide a defense-in-depth approach to protection and resiliency. The existing threats vary from repurposed SATCOM systems used as jammers to purpose-built barrage jammers capable of a variety of jamming techniques. Our team has studied these threats and identified a variety of mitigating techniques and material solutions to provide a defense-in-depth approach and tailor our solutions to each customer and their particular mission needs. I discuss some of these solutions in order of effectiveness in the following paragraphs. TTP’s enable our government customers to withstand a certain level of interference, or jamming, and still be able to communicate despite the effects of the offending signal. Some of these TTP’s might include planning around the interferer, increasing power, beam shaping, beam steering, and other effective methods to operate in the presence of an interfering signal. For example, assuming an interferer is transmitting a continuous wave (CW) carrier and causing interference to a fixed frequency, the user could simply be moved away from the CW carrier to plan around (i.e. mask) the interfering carrier so as to maintain effective communications. Increasing power may work against certain jammers—however, the resultant effect of increasing power may be more detrimental to the satellite and/or other users than it is worth. Beam steering and beam shaping are two techniques, which can be quite effective. Beam shaping or beam steering can effectively remove the jammer from the uplink footprint of the satellite and reduce or eliminate its ability to interfere with users. Of course, in order for beam shaping or steering to be effective the location of the jammer must be known and the users must not be too close to the geographic location of the jammer. Intelsat’s EpicNG class of satellites will enable IGC to employ these techniques for our customers. The ability to geolocate and identify the source of interferers or jammers is paramount. 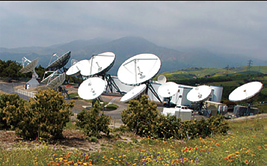 IGC works closely with our corporate parent, Intelsat, to obtain geolocation of interferers in an effort to minimize the effects of interfering signals from both a time and breadth perspective. Further, IGC can also access other geolocation resources belonging to our customer organizations. Carrier Identification (CID) is a newer technology, which is being adopted by the commercial industry and will enable accidental interferers to be quickly identified and contacted to resolve interference cases. When fully employed across the SATCOM ecosystem, CID will also help distinguish between legitimate SATCOM users and jammers. With CID, Satellite operators will now immediately be able to distinguish a legitimate SATCOM user from users who either refuse to adopt the CID technology or nefarious characters bent on disrupting the communications of authorized users. Some military users are concerned about force protection and anonymity of their ground users, and are conducting their own evaluation of the efficacy and security of CID. Of immediate concern is that not all SATCOM users will adopt CID, which will make identification of the nefarious characters more troublesome. It is expected that users who choose to operate without CID will eventually become a minority. In order to address security of military, and other government users, identification and location of end user information should only be available to personnel within military or government organizations and maintained at a classified level, so as to protect the identification and/or location of such users. Commercial satellite operators will only see the CID number associated with an interferer and call the designated organization to report the interference; it will then be incumbent upon the designated organization to contact the end user and resolve the interference event. More complex protection techniques include technical solutions, such as direct sequence spread spectrum (DSSS), frequency hopping, signal cancellation, and other Protected Tactical Waveforms (“PTWs”) in development at this time. IGC is actively involved with several organizations to develop and, eventually, offer these technical solutions to our customers. The IGC Protected Communications Team is working directly with several modem manufacturers to identify and test a variety of new modems under development in the industry. 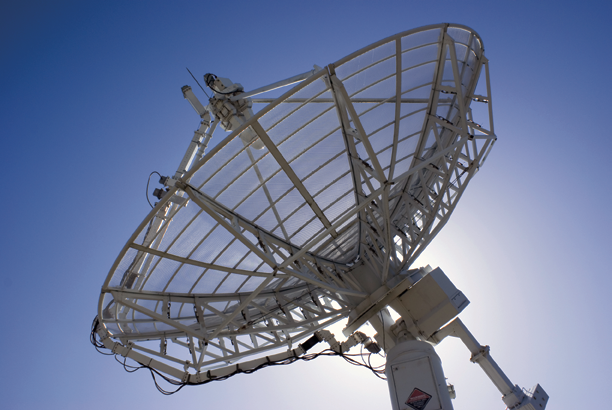 These technologies include terrestrial and space based solutions, which will offer IGC customers the best and most resilient SATCOM available from the commercial industry. Eventually PTWs are expected to rival that of complex military protection capabilities already on orbit at a fraction of the cost. 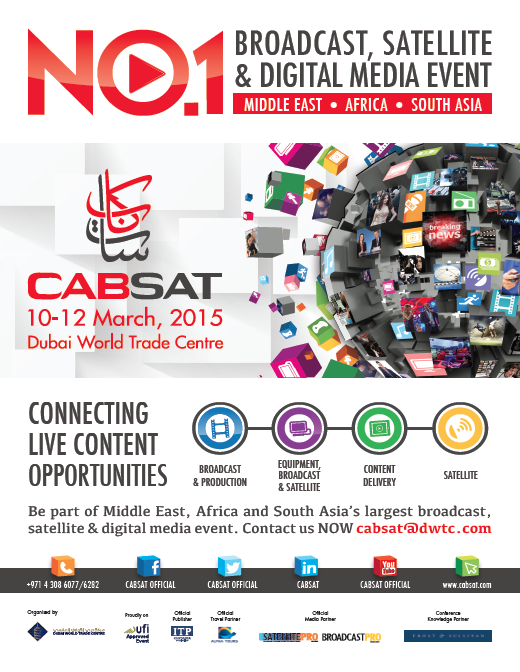 In addition, solutions will be available to a myriad of tactical users, regardless of platform or frequency band. In March of 2014, IGC engineers teamed with L-3 Communications Systems West (L-3 CSW) and successfully tested L-3 CSW’s new modem, which was designed around the U.S. Air Force’s PTW. The test, which was conducted using an Intelsat satellite emulator, measured the modem and PTW performance against various interference and jamming tactics and waveforms. The success of this test is encouraging and helps IGC pave the way toward offering protection, resiliency, and modernization of services for our customers. The IGC Protected Communications Team is chartered to identify, research, and employ various levels of protection for our customers’ bandwidth and services to improve resiliency and reliability in a contested electromagnetic environment. Our efforts in the Protected Communications environment will ensure our customers are operating in the most secure SATCOM environment available from the commercial industry. 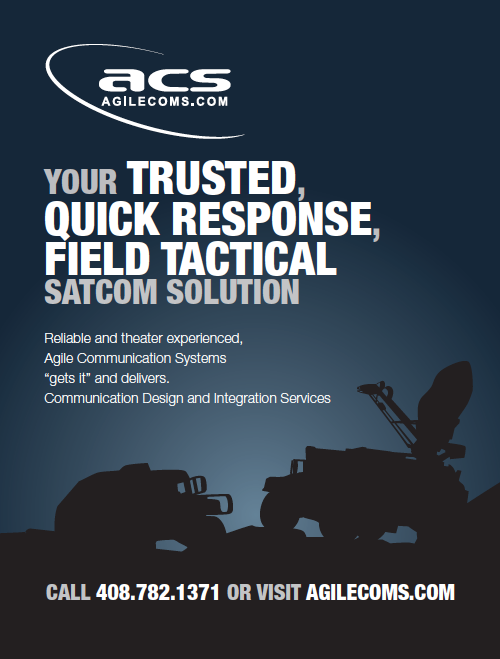 IGC is excited about the capabilities we are discovering for our customers and will continue to lead the industry in providing resilient, uninterrupted, protected SATCOM services. Space is getting more and more crowded and competitive—we will continue to work hard to protect our customers. As the Director of Engineering for Intelsat General, Tim ensures that the engineering team provides support for technical proposals to government customers, including monitoring the integration, installation and testing of equipment and resolution of any technical issues associated with implementation. Tim is leading the Intelsat General team working with Intelsat on development, fleet planning, transitions, and spacecraft design of the new Intelsat EpicNG constellation of satellites. Tim served in the U.S. Navy and completed his career there as an Electronic Warfare Officer and Information Operations Planning Officer for the entire Pacific Fleet. Tim holds a BS in electrical engineering, and a masters in space systems operation as well as an MBA. As Hurricane Arthur (The first hurricane of the 2014 hurricane season) roared toward the Outer Banks of North Carolina on the afternoon of July 3, employees at Knight Sky in Frederick, Maryland, were working with officials from the Federal Emergency Management Agency (FEMA), planning for the worst. Happily, the worst did not happen. The hurricane passed further east, not making landfall “this time.” Damage was relatively light, ground-based communications were not destroyed, and Knight Sky’s SkyMAX services were not required. Nags Head, North Carolina, feeling the effects of Hurricane Arthur. 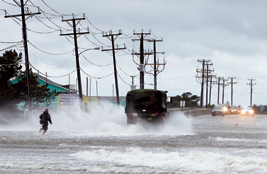 Had Arthur left a national disaster in its wake, Knight Sky was prepared to provide emergency satellite communications to FEMA or the North Carolina National Guard’s command vehicles, which would have been deployed to the Outer Banks. Such is the nature of Knight Sky’s business, according to President George Knizewski. The company provides a majority of the emergency communications required by FEMA and Emergency Management Agencies throughout the United States, using Intelsat’s Horizons 1 satellite and the company’s SkyMAX Emergency Communications Network, managed from its secure Network Operations Center (NOC) located in Frederick. The satellite connection provides FEMA and others with on-site secure communications when a disaster takes out terrestrial communications infrastructure, mobile cell towers and other ground-based services. For incidents such as hurricanes that provide some advanced warning, Knizewski said the company might have a few days to plan a response. However, other man-made or natural disasters such as the tornados during the spring of 2014 in Alabama and Mississippi and the disastrous mudslide in Oso, Washington, that wiped out an entire town, do not provide any advance warning. Yet Knight Sky needs to respond within hours and may be providing connectivity for several weeks. Knight Sky’s contract with FEMA requires that satellite connectivity be provided within four hours of a request, but Knizewski said the company often has the connection up within minutes of notification. “We already have our SkyMAX infrastructure and procedures in place and have coordinated with the customer, so we are always in a state of readiness, 24/7/365,” he said. Knight Sky supports hundreds of emergency response vehicles scattered around the country that can deploy on a moment’s notice in the event of an incident. Once a decision is made to deploy a particular vehicle, Knight Sky receives the official government notification and establishes the satellite connection. At Intelsat General, Kevin Debruycker, the lead Customer Support Engineer, coordinates the connection between Knight Sky and the Horizons 1 satellite or any other spacecraft that might be better suited to the mission. 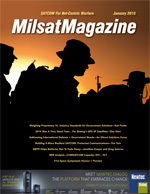 Depending on the size of the mobile ground terminal, Knight Sky and Intelsat General can provide between 1 and 155 Mbps of broadband connectivity for voice, video and data that meets the performance, reliability and information assurance requirements of GSA and the security requirements of the Federal Information Security Management Act (FISMA). In addition to FEMA, Knight Sky provides emergency communication services to U.S. Army North, based in Ft. Sam Houston, Texas, which is responsible for assisting in national disasters. Knight Sky also provides similar connections to about a dozen state Emergency Management Agencies and National Guard Units. Knizewski said meeting the security requirements when interconnecting with a government network is a particular challenge of his business. FEMA and Army North have their own distinct technologies and procedures, and each individual state has its own particular methods and regulations of establishing and maintaining secure emergency response communications. “The National Weather Service is predicting a slow hurricane season, but of course there is no guarantee of that, so we are ready,” he said. “Summers have become the busy season for us. We are extremely proud to support federal, state and local agencies with emergency communication when disaster strikes right here at home.